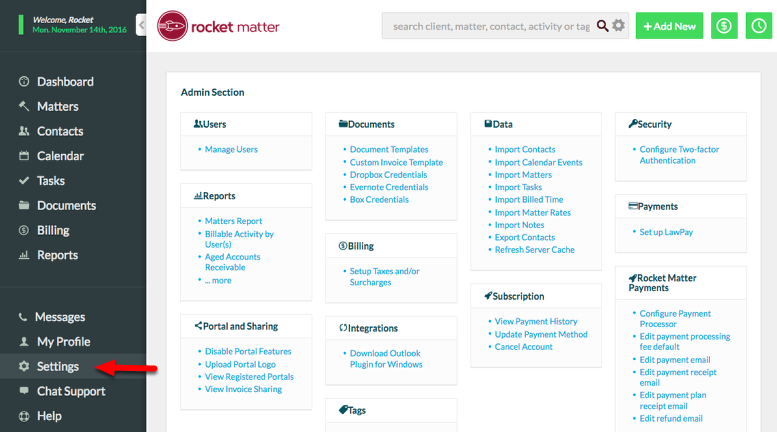 Rocket Matter Knowledge Base Matter TemplatesHow to create a matter template for an existing matter. 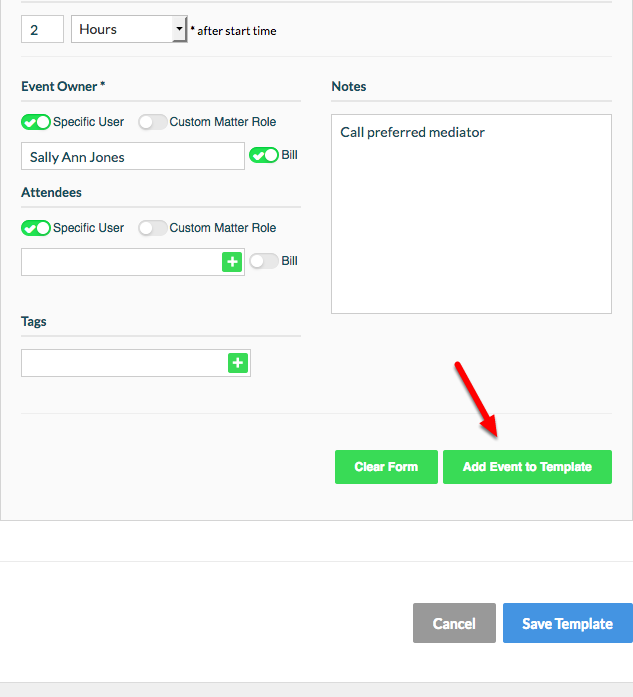 Matter Templates make it easy to automate your workflow. You can implement Matter Templates when you first create a matter, and you can also apply Matter Templates to an existing matter. 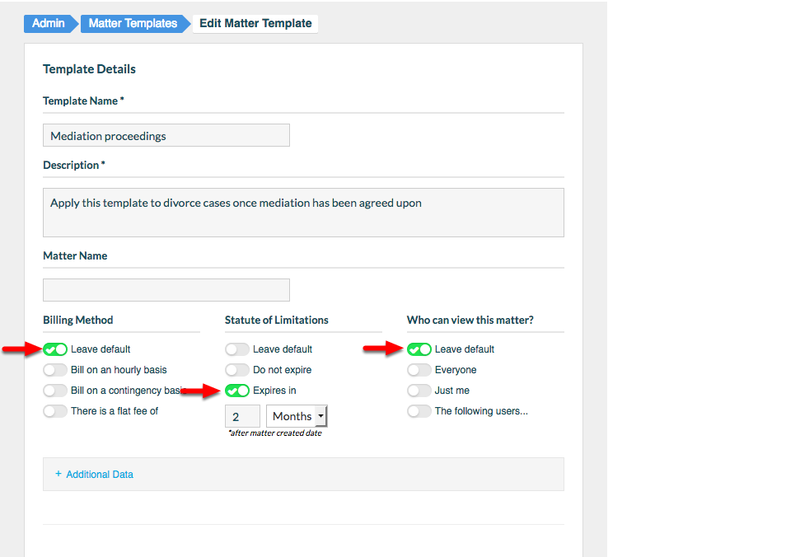 This FAQ details how to create a Matter Template which is suitable to layer onto an existing matter. 2. 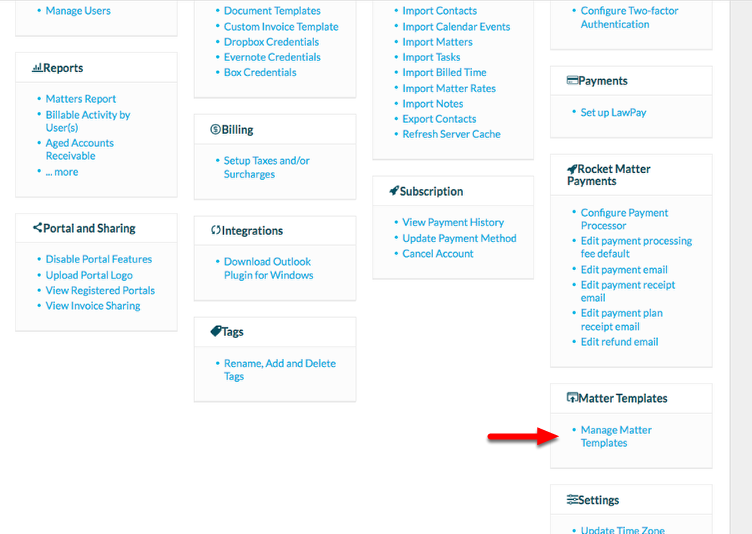 Scroll down and click "Manage Matter Templates". 4. Enter "Template Name", "Description", and "Matter Name". Zoom: 4. Enter &quot;Template Name&quot;, &quot;Description&quot;, and &quot;Matter Name&quot;. 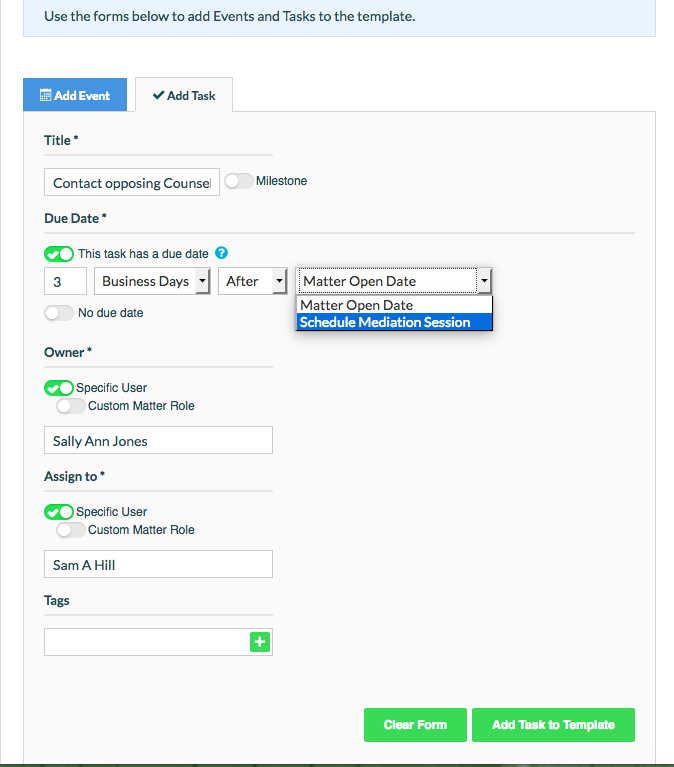 You will have the ability to OVERWRITE existing Matter Data when you apply a template. 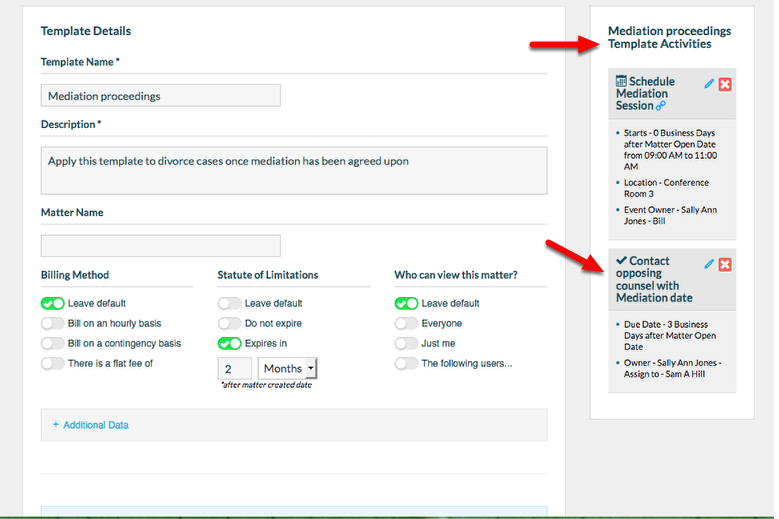 You will be able to choose which items to over write when Matter Templates are applied,, and confirmation will be required before applying the details of a Matter Template to an existing Matter. 2. Selecting an additional option will reset that Matter option. i.e. By selecting "Expires in" and filling in an expiration date, once the Template has been applied to the Matter, an expiration date will be applied. 6. 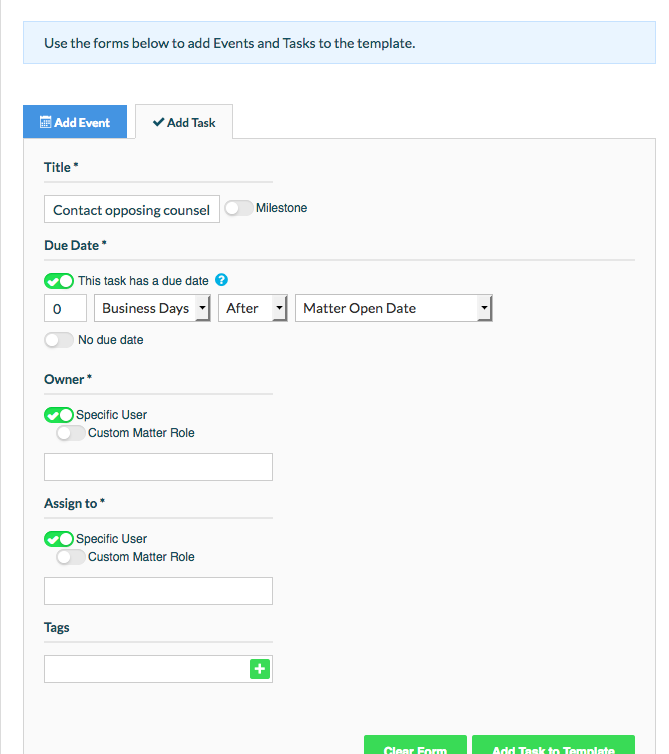 Select "+ Additional Data" to apply matter and custom field data. Apply data and relationship fields as needed in this section. 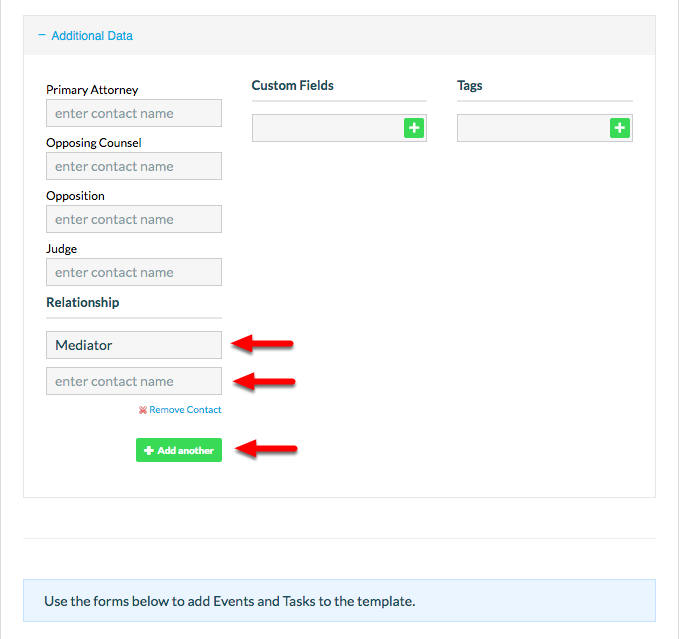 - Clicking "+ Add Another" will give you the ability to add another custom field, for example: "Mediator" is the 'role name' field. - Adding data to the 'enter contact name' field will populate all your matters with your specified contact name. 7. 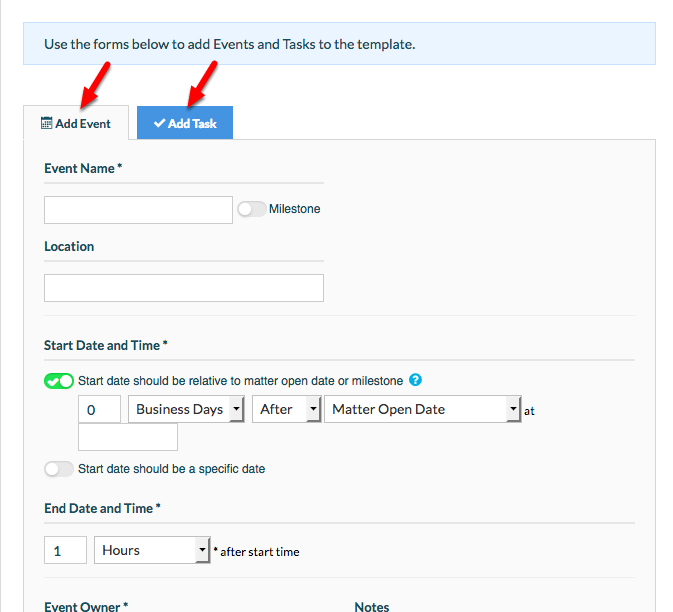 Select "Add Event" or "Add Task" buttons to create a workflow of events and tasks. 8. 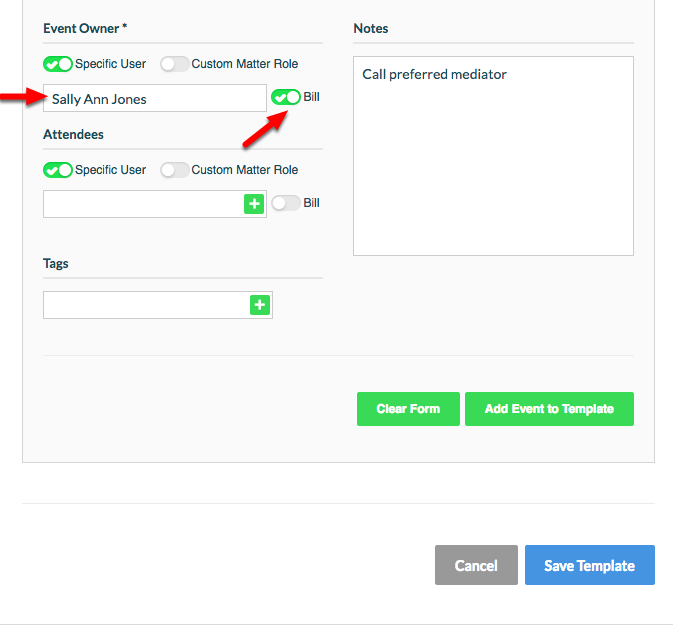 Select "Add Event" to add an event to your matter template workflow. a. 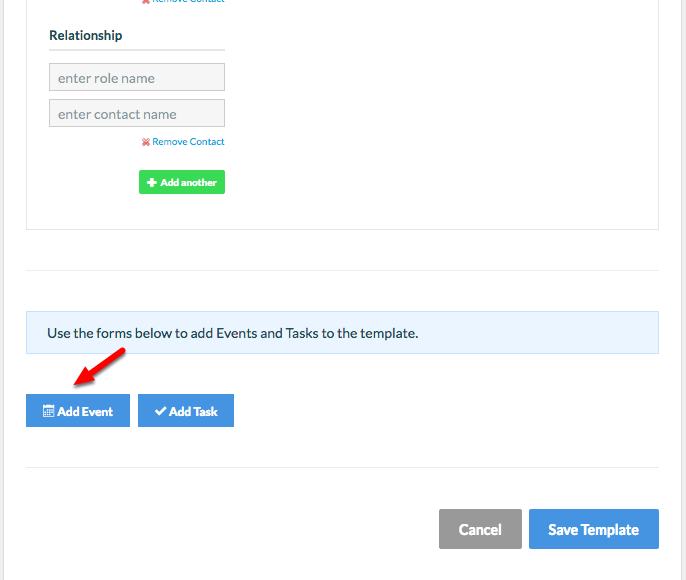 Select "Add Event", and add a "Title" to add an event to your workflow. b. Designate the event as a milestone to designate a "parent event', from which you can create a cascade of related dependent events. Mark the event as a Milestone to designate a "parent event'. 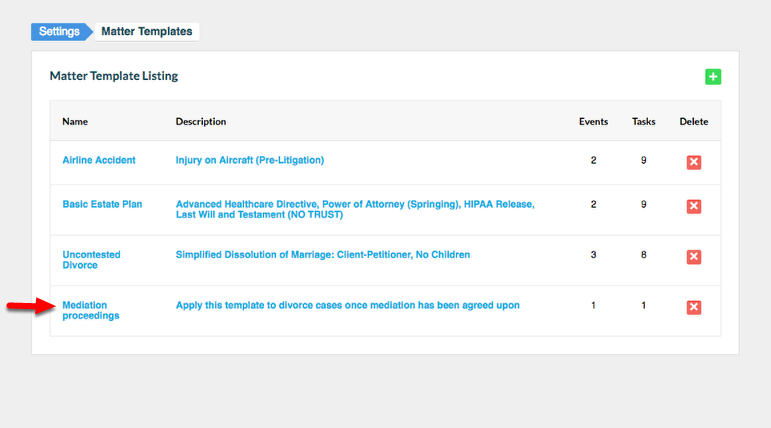 Milestone events become reference events from which you can create a cascade of dependent "child" events. The original "Milestone" event is the date the matter is created. 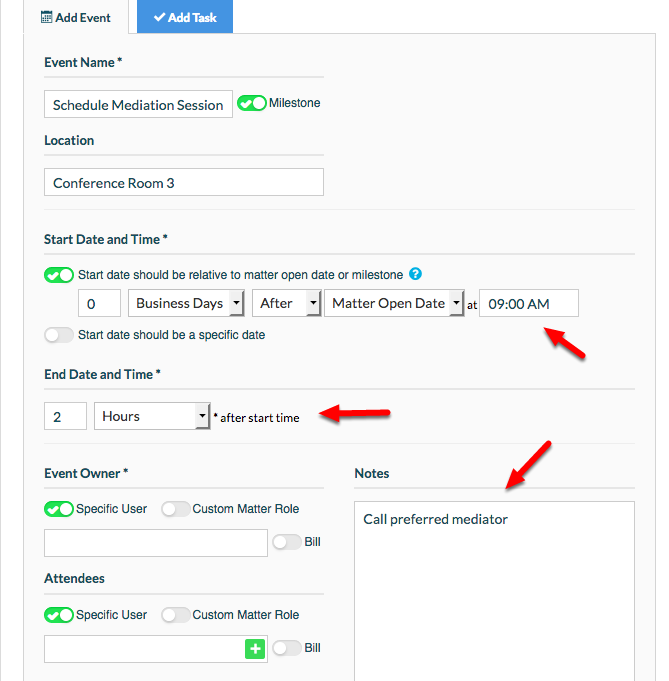 c. Determine if this event will be linked to the "Matter Open Date" or a previously created milestone. The original milestone event is the "Matter Open Date". 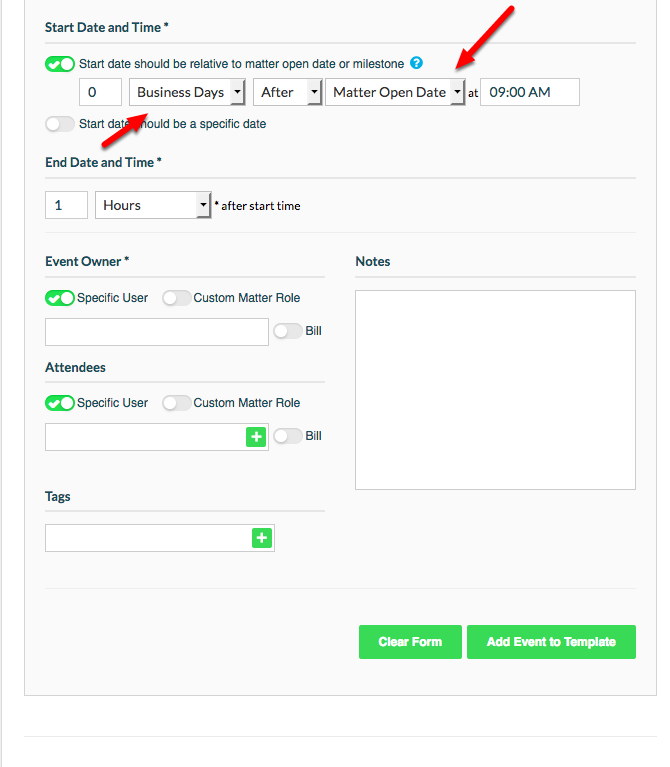 d. Fill in relevant event details, making sure to fill in the required fields marked with a *. e. You can add a user and automatically bill time by selecting "Bill". 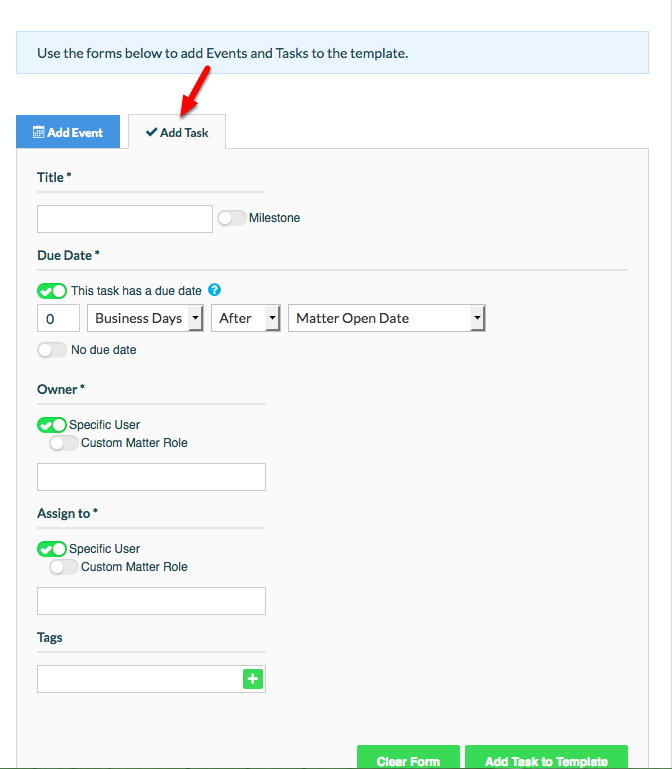 As you create multiple events and tasks, don't forget to "Add Event to Template" or "Add Task to Template" to save the item to your workflow. g. View the event in the "Template Activities" section. 9. 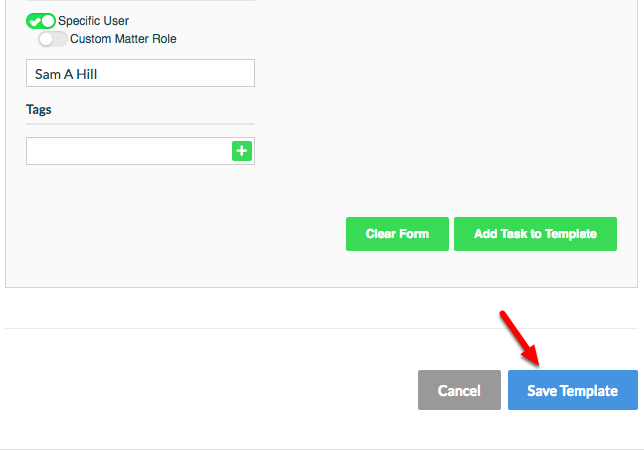 Select "Add Task" to add a task to your matter template workflow. a. Select "Add Task" and add a "Title" to add a task to your workflow. b. 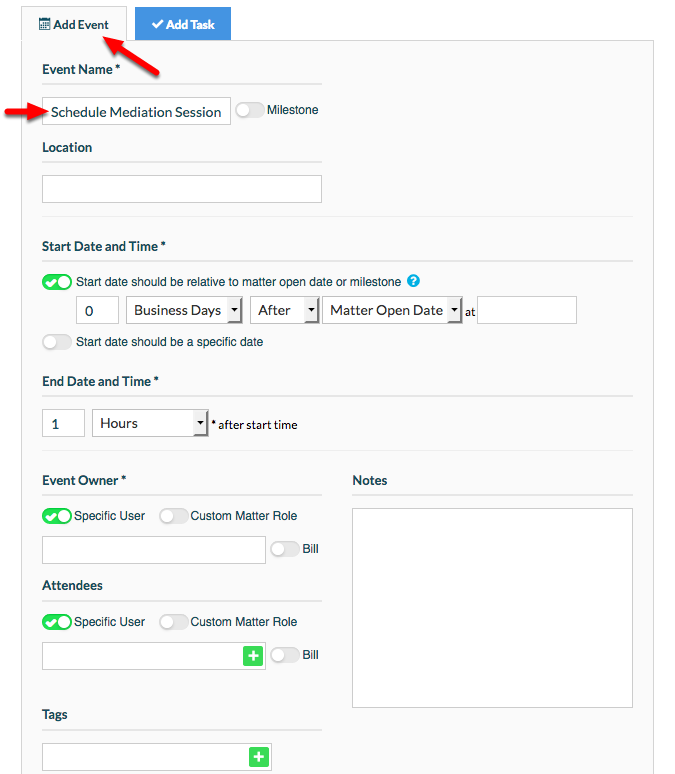 Fill in relevant information, including required * events and "milestone" indicator if applicable. 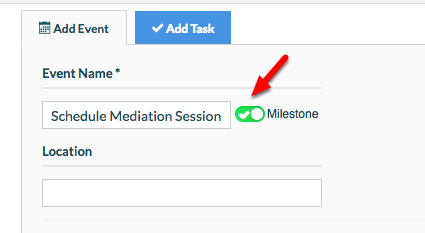 Designate task as a milestone, or designate milestone anchor for due date as needed. c. Click "Add Task to Template" to save the task to your workflow. d. View the task in the "Template Activities" section. 10. Create additional events and tasks as needed. You MUST save your template after creating your series of tasks and events, or none of the items you created will be retained. 12. 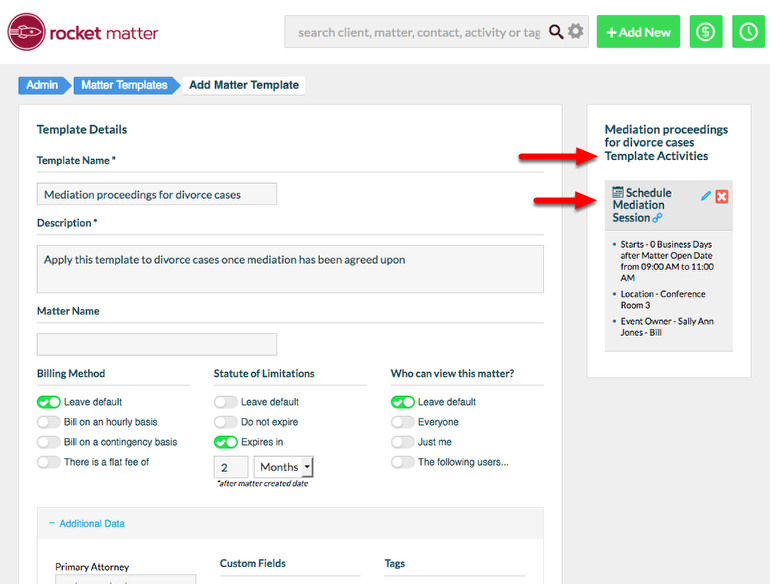 View the completed matter template in the matter template listing section. 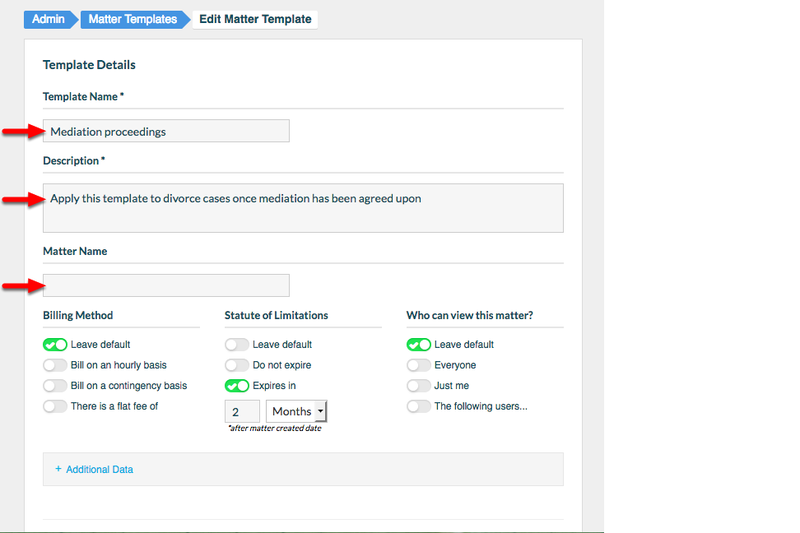 Now that you've created your Matter Template suitable for an existing matter, you can apply your Matter Template to an existing matter. Prev: How to create a matter template for a brand-new matter. Next: Invoice template merge fields.